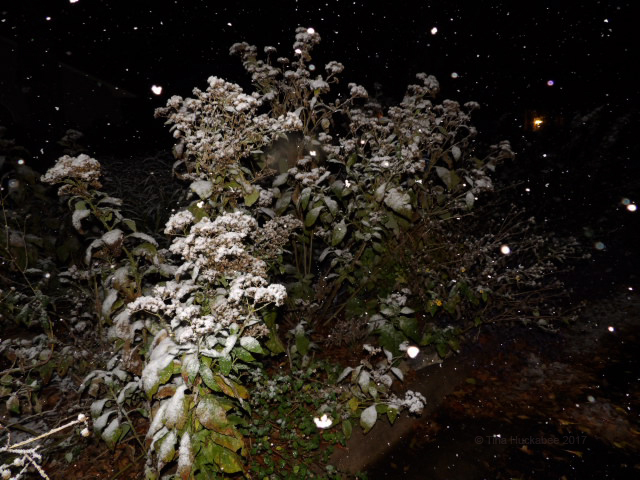 For my northern North American brethren and European gardening allies, prepare to snicker, guffaw, and roll your eyes as I gush about SNOW!! 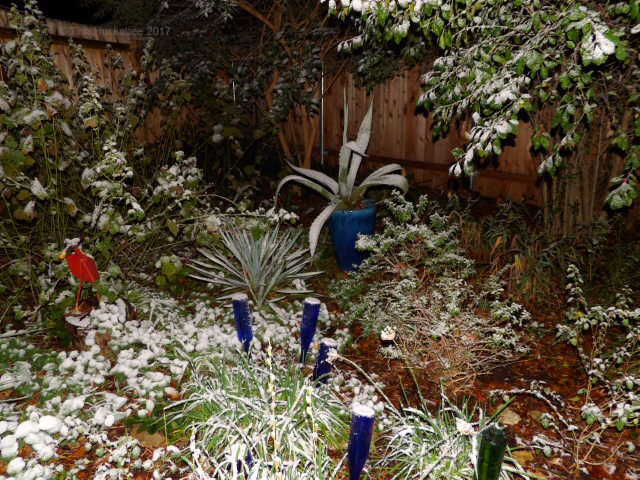 Yes, we had snow last night–the first snowfall here in Austin in 13 years and just over an inch fell. 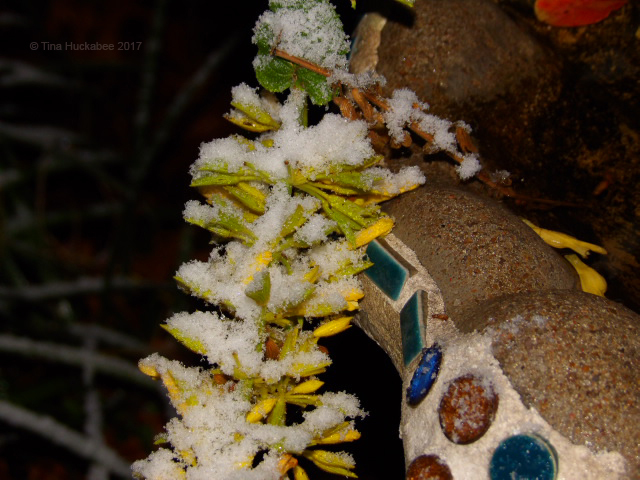 I hadn’t tuned to the weather and didn’t realize that the we may get a few snow flurries forecast was something to actually pay attention to–until those flurries started just after sundown. 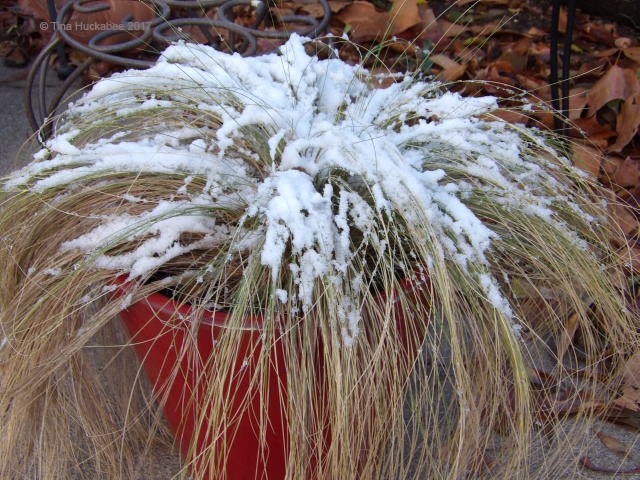 Tropical, but Austin hardy, Firecracker plant (Russelia equisetiformis) in winter garb. Century plant (Agave americana) and Drummond’s ruellia (Ruellia drummondiana). 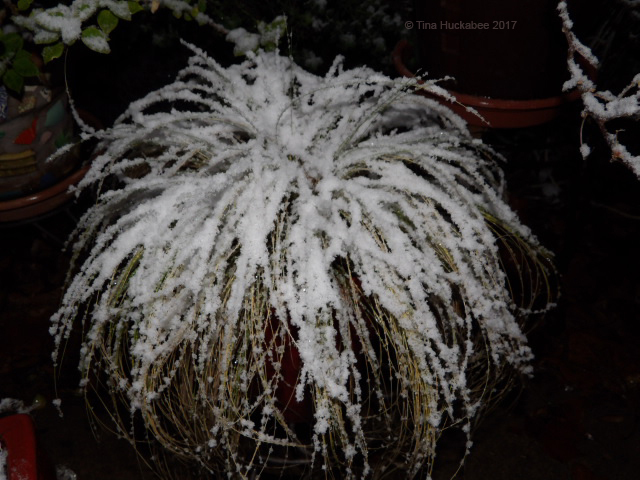 Looking like an icy Cousin It, is this Mexican feathergrass (Nassella tenuissima). The back corner with plenty of snowy highlights. We used to get snow, roughly every other year, but in recent decades, when winter precipitation occurs, it comes in the form of ice storms, which are no fun for anyone. Chili pequin (Capsicum annuum)–fruits and all are covered. But snow? Well, that’s fun for us! 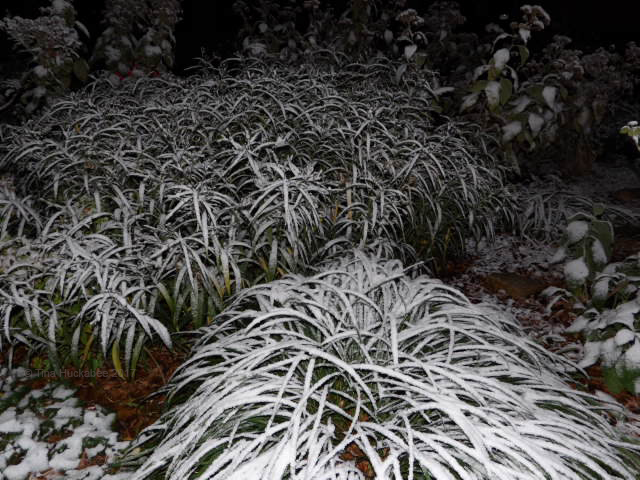 It’ll be interesting to observe whether the bloomers still blooming will slough off this brush of snow and light freeze. 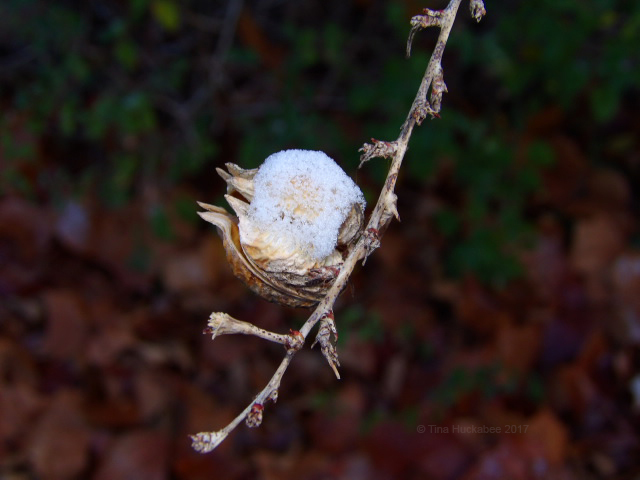 Forsythia sage (Salvia madrensis) is a Mexican mountain plant, but rarely sees snow. It’ll return from its roots, but the blooms might be done for the year. 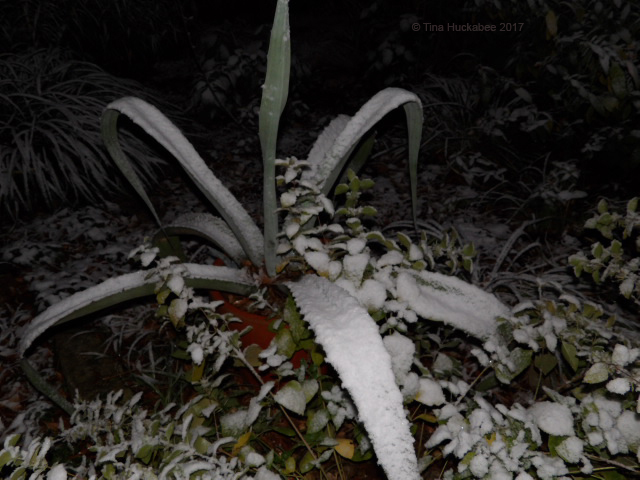 Our temperatures hovered at freezing, so this was not a hard freeze, but just enough to keep the snow for some morning photos. The nighttime snow show was quite lovely, the morning snow a bit more lame. 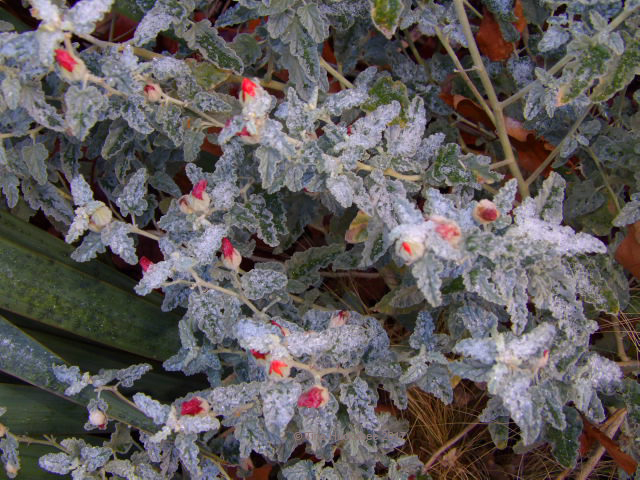 Globe mallow (Sphaeralcea ambigua) will also be fine with the cold and often flowers in winter. 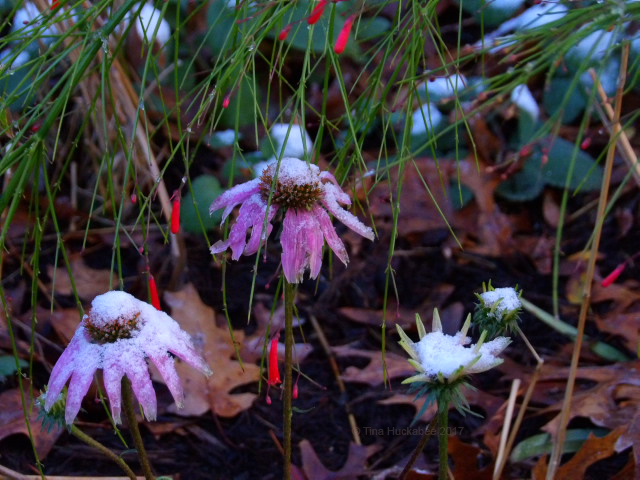 Purple coneflower (Echinacea purpurea) with a dusting of the white stuff. Some branches and blooms of Firecracker plant photobomb the Coneflowers. 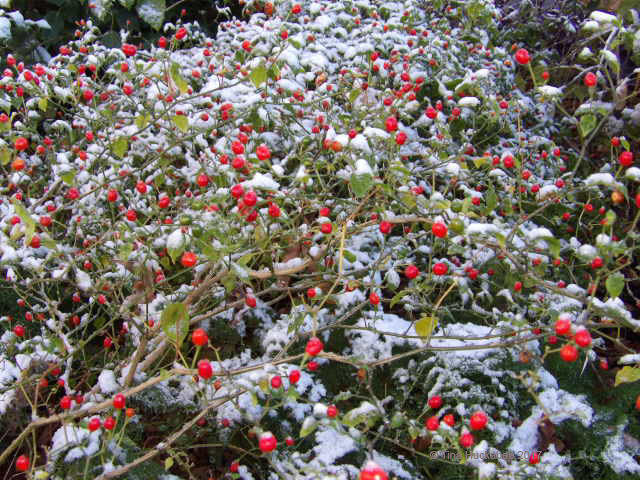 The peppers of Chili pequin pop from the snow and compete for this December beauty contest. 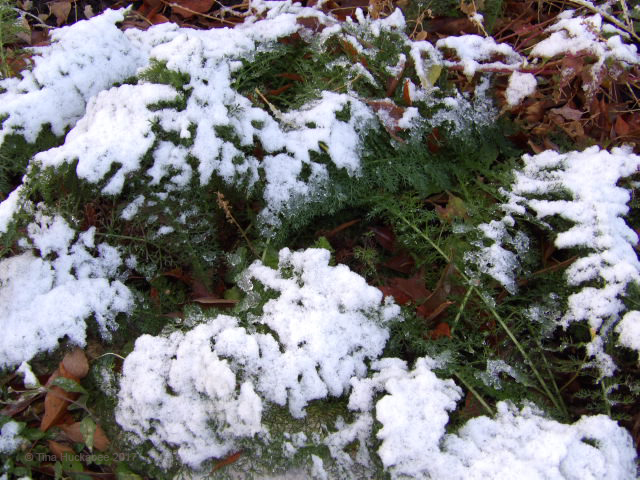 Yarrow (Achillea millefolium) is a beautiful and evergreen groundcover, rendered more attractive with snowy decorations. 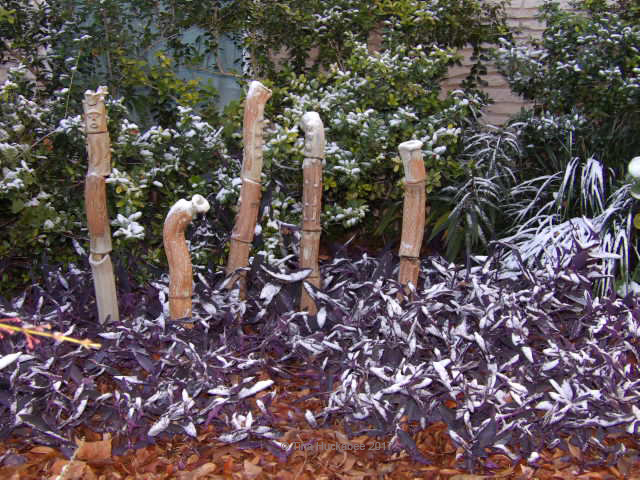 Purple heart (Setcreasea pallida) might be done for the year as it doesn’t care for cold. It will return in full force with warmer temperatures. 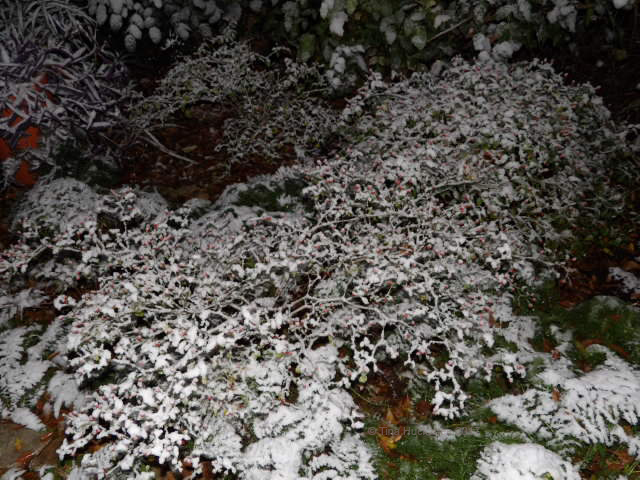 Still, the light blanket of snow is pretty. 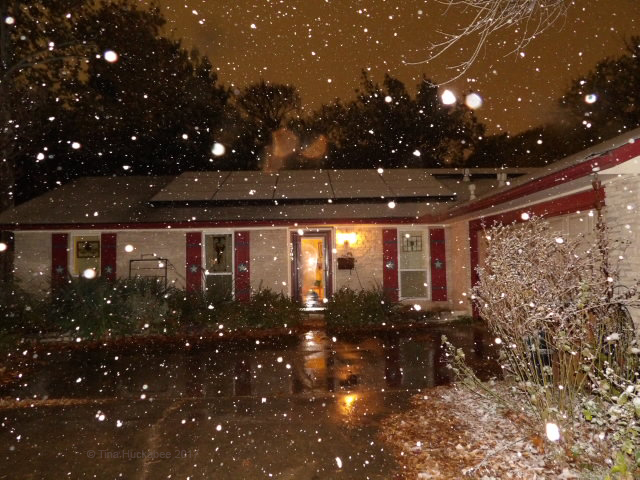 Snow lingers, but the Texas sun will take care of that as the day moves forward. You got much more than we did! What neighborhood are you in? I was so surprised to see your post, because another friend who lives on the west side of Austin said there wasn’t any where they live. Of course, people inside the Houston loop got more than we did down here by the bay, and people farther down the coast got even more. I think I saw 4 or 5 inches around Corpus. In any event, it was wonderful. I’m glad I got up to capture a few flakes at 4 a.m., because it’s all gone now, save little shaded patches here and there. Ah, ha. 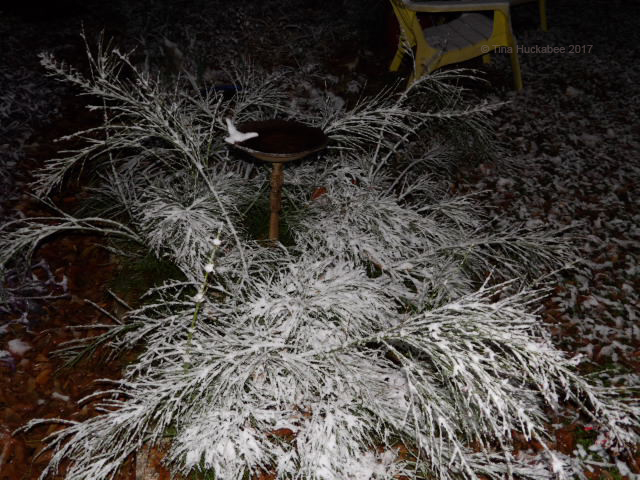 We got the same amount of snow, but we were just enough warmer than you were that it didn’t accumulate so nicely. There was plenty of buildup on roofs and cars and such, but not so much on the grass and plants. 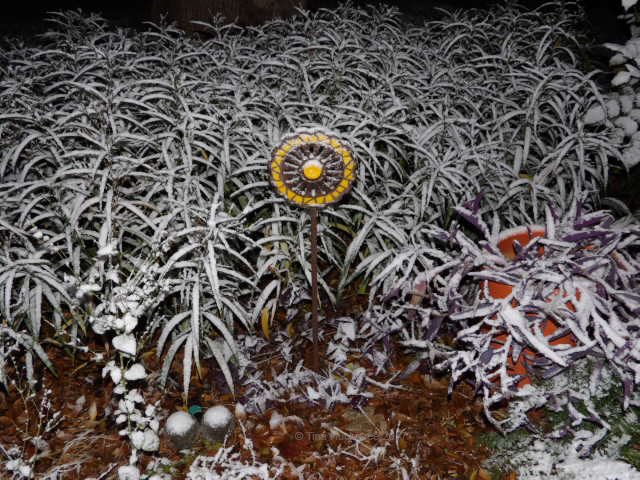 I noticed that my front garden really rocked the snow look, while some of the “yards” around me, not so much. It was wonderful and there’s still snow around, though rapidly melting. I’m shocked at how much Corpus had and San Antonio had 2 inches! So fun for those of us who live in a warm climate to enjoy snow. Hey! I was just bragging about our frost! I thought I had something going here! Haha. We do get snow from time-to-time, but I was just SO not prepared! Everyone was out in the snow here and some schools were delayed. Yup, same with us. It was a gorgeous day, though! Awe, thank Sue. Just after I hit the ‘publish’ button, I realized that I didn’t include the Australian gardener and wildlife enthusiast (that’s you!) in my introduction. That said, does anyplace in Australia get snow? Mountains? And it was a treat! Wonderful, enjoy it! We might get some tomorrow. 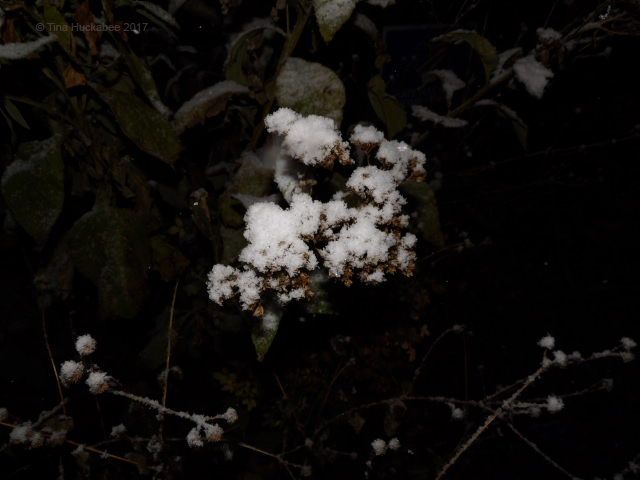 Tina that so wonderful photos of the falling snow and then on the plants. I love snow, it’s very fun. 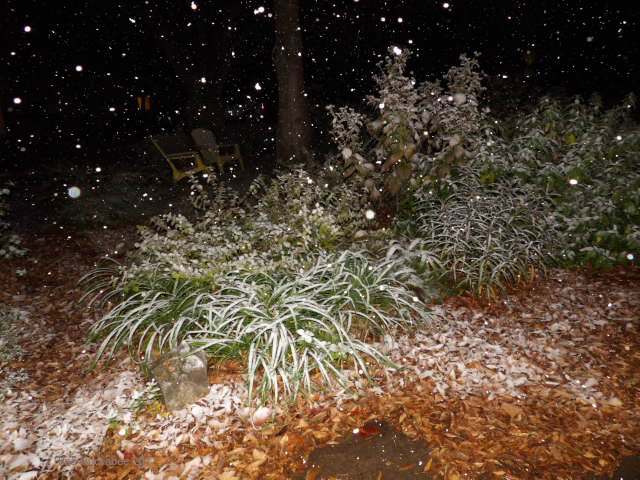 When we are in the country house it always snows. Here in Madrid if it snows is the traffic chaos. 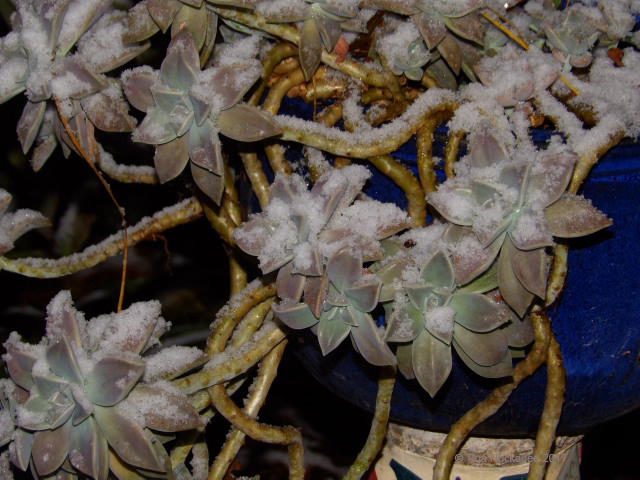 I hope your plants have not been frozen and spoiled. Since it’s been a long time since I’ve snowed in Austin, Tina has a great time with the snow and enjoy it! Thanks for your beautiful photos. Greetings from Margarita. We have the same traffic chaos here, Margarita. It snows and ices over rarely enough that schools and many businesses delay opening or close. But everyone was happy to enjoy it for the night and morning. You have more snow than we do! We have yet to get a full inch. And highs in the 40s day after day–quite mild for Laramie in December. Wow–amazing and not a little scary! Funny, I was just thinking (not near my computer or phone) that I hadn’t read you in a while. My bad! Your enthusiasm is contagious! You’ve had more snow than we have here in S. Wisconsin, believe it or not. I’m happy that you got to share in the magic of the season, and that you enjoy it. 😉 It certainly is beautiful and your photos are lovely. Wow again. And snow is one of the main reasons I couldn’t live in Wisconsin. 🙂 That said, it was 71 today, so our freezing temps don’t last. Love it! 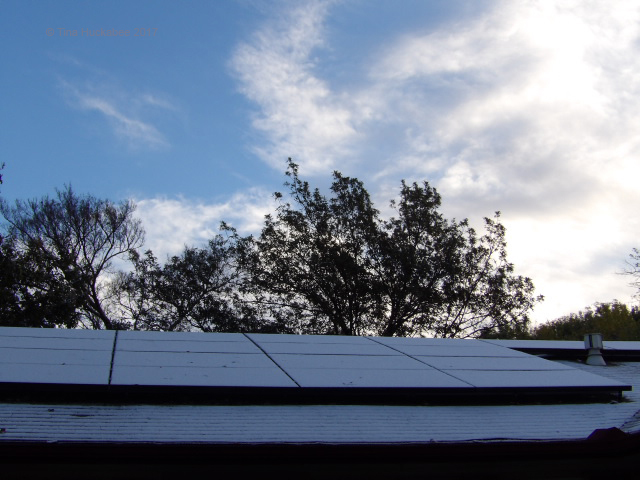 But the same is true here in southern Britain—things come to a complete stop at an inch of snow…. Ah, that’s interesting. I guess I’d assumed you get more of the frozen stuff and are more used to it that we are. 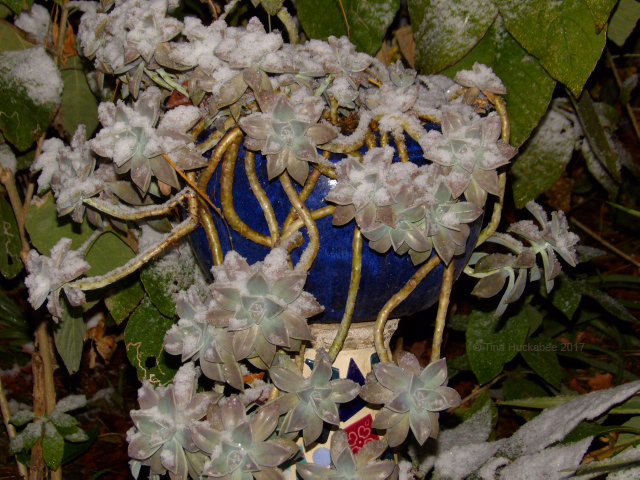 A hard freeze, in wet conditions, is much worse for us. Our various bridges and overpasses didn’t freeze and close down (actually, I think one did), so traffic was slow, but not stopped.